When I first encountered Edwin Long’s “The Babylonian Marriage Market” hanging in the Picture Gallery at Royal Holloway, University of London, I remember being quite struck by it. 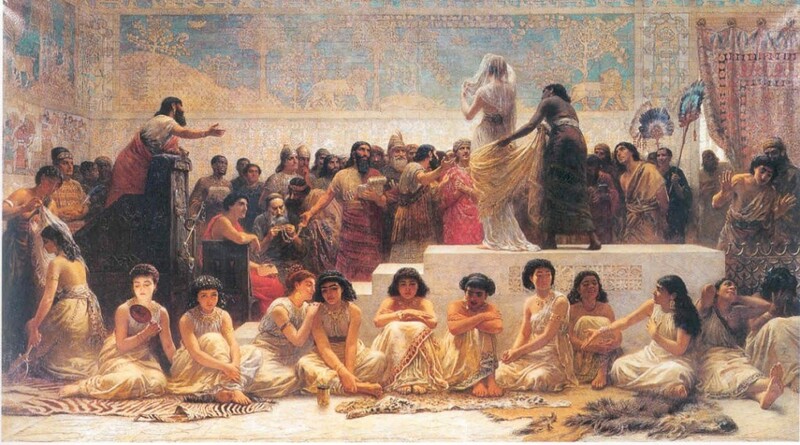 The painting depicts a scene from a marriage market in Ancient Babylon where women were auctioned off as wives. The beautiful amongst them were sold to the highest bidder, whilst the poorer men, having no need for good looks, took the less attractive women with dowries that were paid with the money raised by their more attractive sisters. For Long, the painting mirrored 19th century society, suggesting that the marriage rituals of his time were not very different from those of ancient civilisations. Ironically, it struck me that the marriage rituals of today have not changed much from the 19th century, or indeed from Ancient Babylon, especially within many Muslim cultures worldwide. And neither has society’s definition of women’s beauty: the women in the painting stand in order of beauty which, it appears, is determined by skin colour. The most fair is so beautiful that her face is turned away from the viewer who can only imagine her beauty through noting the awe apparent in faces in the audience, whilst the darkest sits in a shadowy corner with her face in her hands, utterly distressed both by the thought of having to face such an unforgiving audience and the knowledge of her fate. This painting, I’m sure, will strike a chord with many. Whilst today’s modern age defends the desire for fair skin as a personal preference, it is important to understand that colourism (or hueism) – the differential treatment of people according to skin colour both racially and interracially – is inextricably linked to racial discrimination, colonial power and the concept of white privilege. Those familiar with at least recent colonial history will be aware that fair skin has never been just a personal preference of colour, but has in fact been considered a commodity, a tool of power and ultimately a symbol of social status that trumpets power and success. As such, the absence of this commodity signifies failure and disempowerment. Throughout history, women have been treated as commodities by their male counterparts, to be sold, bought and possessed for their bodies. So what greater symbol of social status is there, asks the post-colonial world, than the possession of a fair skinned woman? For a woman to accept this desire for whiteness is, in effect, to unconsciously internalise her own commodification, to enslave her self to kyriarchal powers. This may sound like a melodramatic feminist rant, but if you think back to your last encounter with colourism, it cannot be denied that the extent to which this issue permeates Muslim communities is outrageous not only because it exists, but more importantly because it has become so flagrantly acceptable. I can think of at least three such incidents that both worried and angered me about the state of Muslim societies: the first incident occurred at a Pakistani wedding, where a friend of the bride, the only black woman to attend the reception, came dressed in full Pakistani attire. She looked absolutely stunning and couldn’t have escaped anyone’s conversation that day: “She looks so beautiful,” they said, “even though she’s black.” I’m not sure why their comments surprised me so much, as darker-skinned Pakistani women often receive similar comments. What exasperated me, however, was the inability for any person in that reception to perceive beauty in darker skin – and to recognise that this woman looked beautiful not because of her fancy shalvar kameez, but rather that her skin colour was accentuated by what she wore. The second incident occurred on the encountering of a South Asian woman who had done the unimaginable by downgrading and marrying a black man. Not only were other South Asians incredulous as to why a woman would marry a black man (which had more to do with skin colour than racist stereotypes) but they also went as far as declaring that her children were strange-looking. Had she married a white man and given birth to fair skinned children, there’s no doubt she would have been the envy of all the community. It disgusts me to see Muslims judging children by their skin-colour; can you imagine the stigma that these innocent souls will face growing up and how it will affect them? The third example is more of an observation of a whole system, rather than a single incident: the prejudice against women with darker skin-tones during the marriage search. My experience is limited to the South Asian rishta process, but I do not doubt for a second that colourism does not occur during the marriage search within other cultures and communities. Few of those who have had the pleasure of partaking in the rishta process will have escaped the colourism that engulfs it; indeed, it has become such a socially accepted practise that mothers searching for a wife for their sons, or indeed the brothers themselves, will openly reject an educated, professional and practising Muslimah with good character and great potential, on the grounds of her skin colour. A woman, it seems, is first to be judged by the colour of her skin before her whole life’s work is taken into consideration. A trophy wife, it appears, must be a fair-skinned wife. Whilst an attempt to disguise this desire for fairer skin is made in the West, in South and East Asia the desire has reached ridiculous heights: if skin lightening face creams weren’t bad enough, the latest craze in skin lightening products targets the private parts. Adverts that accompany such products claim that by procuring fairer private parts, it is possible to be transformed into a more beautiful, successful and empowered woman – through satisfying your husband, of course. If this feminist rant hasn’t won you over, then perhaps it’s time to be reminded that colourism, this deceptively innocent ‘personal preference’, is in fact contrary to Islamic teachings as, ultimately, it is not only discriminatory and exclusionary, it is a rejection of the beauty of Allah’s (SWT) creation. Furthermore, it is also a rejection of the high status with which Islam empowers women. In the Prophet’s (SAW) last sermon, he warned his Muslim ummah against such discrimination by declaring that no Arab is better than a non-Arab, no white is better than a black, or a black better than a white, except in God-consciousness. Islam teaches us that the beauty of a woman, and indeed any human being, lies in their character and deeds, and not in their appearance. Despite these Islamic teachings, colourism is practised even amongst those who are educated, possessing Islamic knowledge and supposed understanding. In order to challenge this, as Muslims we must first ensure that we do not internalise this desire for whiteness on a personal level. Of course, this is easier said than done, especially as maintaining and achieving fairer skin has become a social norm in many communities. We must all fight this on a personal level: we cannot be the perpetrators of our own oppression. The first step is to not only accept that colourism is wrong, but also to challenge the dunya’s definition of beauty. Dump the lightening creams and don’t deprive yourself of the sun in fear of getting a tan (let’s face it, we need the vitamin D); instead, eat well and look after your health: beautiful skin is not fairer skin, but healthier skin. After freeing yourself from this, encourage others to free themselves of this self-oppression: be vocal about this issue, challenge the opinions of others from both a political and Islamic point of view. With a history than spans centuries, the fight against colourism will most probably be a long and arduous one. But this gradual erasure can only be possible if each generation ensures that the next generation suffers less than those before them. As mothers, we must teach our children to not only love themselves as unique individuals, but also to love humanity in all its colours without judgement and prejudice. “Whilst today’s modern age defends the desire for fair skin as a personal preference, it is important to understand that colourism (or hueism) – the differential treatment of people according to skin colour both racially and interracially – is inextricably linked to racial discrimination, colonial power and the concept of white privilege.” everytime I read this- and you know I have several times- I’m like, YES! Great writing Hafsah- thank you! Thank YOU, Brooke! Writing this has made me even more aware of how much colourism pervades our communities, especially in second/third generation Muslims in the West – it’s not even a straightforward desire for fair skin, it’s like this insecurity that is full of guilt which completely undermines everything that they already know and understand about racism and gender.